The W2Power concept is a revolutionary combination of structures for wind and wave power. 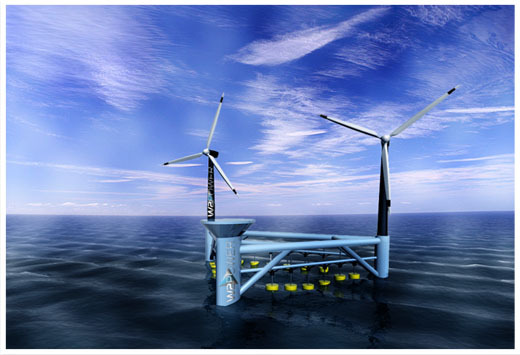 The triangular, light-weight semi-submersible platform will be fitted with two counter-rotating, 3 MW wind turbines. The third corner of the platform is reserved for a helipad, ensuring easy access for inspection and maintenance. Along the 90 meters long sides of the platform, arrays of wave pumps based on the company’s proprietary Pelagic Power 1 concept will be installed. These pumps will deliver an additional 3 MW, thus bringing the total installed capacity of W2-Power to 9 MW. Based on meteorological data from the North Sea, expected yearly electricity production will be 40 GWh. The development of the wave pump technology started in 2006 with a project called Pelagic Power 1 (PP1). This project was a pure wave power plant and was tested at 1:3 scale in 2008. The testing confirmed that the technology worked, but there were problems with the installation of the buoys. Pelagic Power therefore brought the experience gained from PP1 into the improved concept W2Power in 2009. The wave pumps work by using buoys following the vertical movement of the waves. These run a piston that pumps seawater into a central pressure chamber and to one, shared Pelton turbine. By utilizing a single turbine for the arrays of wave pumps, W2Power lowers costs and has fewer sources of errors. The platform itself is a triangular, standard semi-submersible. W2Power is anchored in the helipad corner to provide a pivot point. This ensures that the wind turbines will be operating under optimal wind direction conditions. The structure is very stable due to the low water line area. This ensures maximum relative movement between the buoys and the platform. In addition, the platform design creates a bending moment for the wind turbines. This allows W2Power to extend only 10 meters below sea level, while still being able to compensate for the forces created by the turbines. As a result, W2Power can be built, transported and installed in shallow waters. Optimal water depth for the units will be 40 meters or deeper. Simplicity and reliability have been design criteria for the W2Power concept. Semi-subs have survived the North Sea for decades. Wind turbines on offshore bottom-fixed structures are proven to survive. The wave power system exposes only simple buoys to the energy intensive areas near the surface. Major waves will simply submerge these buoys. During the PP1 test period, the wave power system proved it could survive a storm strong enough to rip the mooring chains apart. W2-Power will survive the rough conditions of offshore sites.